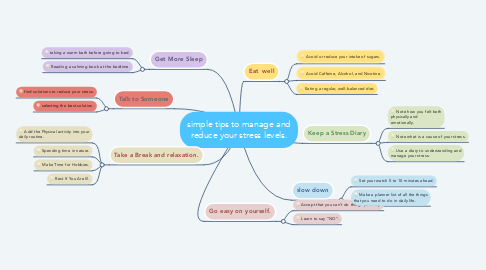 simple tips to manage and reduce your stress levels. 1.1. Avoid or reduce your intake of sugars. 1.2. Avoid Caffeine, Alcohol, and Nicotine. 1.3. Eating a regular, well-balanced diet. 2.1. taking a warm bath before going to bed. 2.2. Reading a calming book at the bedtime. 3. Take a Break and relaxation. 3.1. Add the Physical activity into your daily routine. 3.2. Spending time in nature. 3.3. Make Time for Hobbies. 3.4. Rest If You Are Ill.
4.1. find solutions to reduce your stress. 4.2. selecting the best solution. 5.1. Note how you felt both physically and emotionally. 5.2. Note what is a cause of your stress. 5.3. Use a diary to understanding and manage your stress. 6.1. Set your watch 5 to 10 minutes ahead. 6.2. Make a planner list of all the things that you need to do in daily life. 7.1. Accept that you can’t do things perfectly. 7.2. Learn to say ‘’NO’‘.